The electrical power system is facing challenges due to the increasing amount of distributed energy resources with stochastic behavior. While the distribution grid has traditionally operated with alternating current (ac), nowadays most devices operate with direct current (dc) internally, and most distributed renewable resources generate power in dc. Moreover, storage components as batteries and supercapacitors have a dc character. 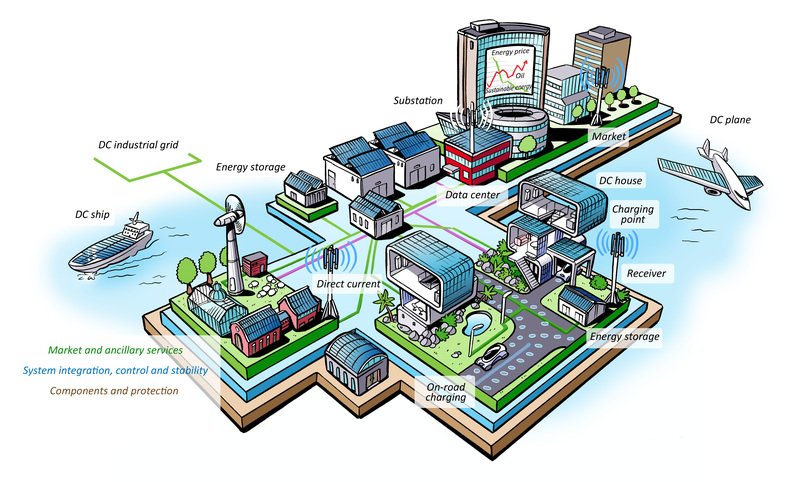 DCSMART is an interdisciplinary project that aims at enabling a straightforward integration of smart grid system technologies, the creation of market opportunities and stakeholders adoption through the development and implementation of dc distribution smart grids. The dc distribution smart grids will be based on modular and scalable concepts and will be validated in two demonstration sites, one in the Netherlands and one in Switzerland. Innovative smart markets and smart grid applications such as active demand-side management will be implemented.